The Grater Flamingo Phoenicopterus roseus has been well studied during the last decade in Algeria leading to highlight some aspects of its distribution, status, movements, and population dynamics. Knowing that an important part of the country has rarely or never been investigated, we studied the status and behaviour of the species in two newly discovered wintering populations (Sebkhat Ouled Amara and Sebkhat Ouled M’barek) in the Northern limit of Sahara, Khenchela, Algeria. The number of individuals was higher in Sebkhat Ouled Amara than Sebkhat Ouled M’barek showing peaks of 8 000 and 1 452 in the winter, respectively. Diurnal activity budget revealed that feeding was the most dominant activity representing 73.5% of all activities. Locomotion, flight, preening, courtship, and resting accounted for 12.3%, 6.2%, 4.0%, 2.8%, and 1.3%, respectively. There was no marked seasonal change in the behaviour of flamingo except for courtship which increased in the breeding season. Diurnal activity rhythms showed that locomotion, preening, and resting decreased in the afternoon while courtship and flight increased. 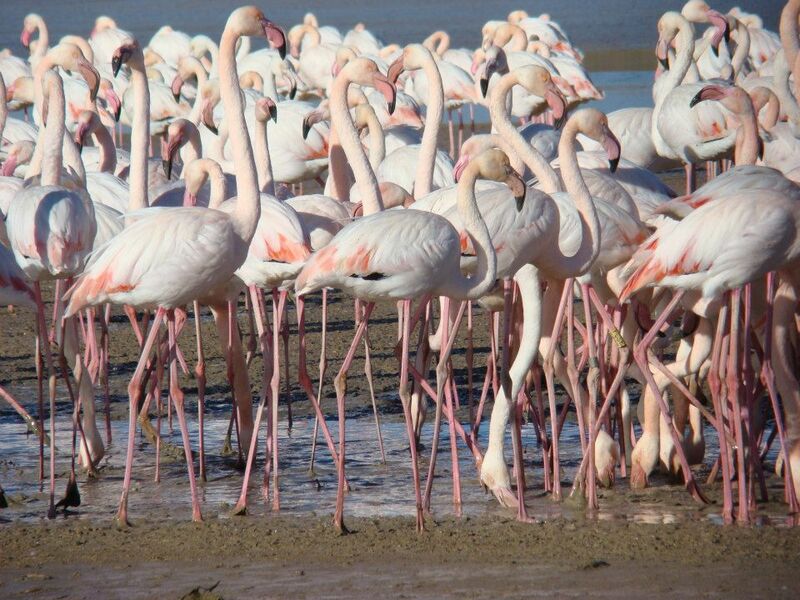 This entry was posted in Algeria and tagged Greater Flamingo, Phoenicopterus roseus, time budget, wetlands, wintering. Bookmark the permalink.